The design team of BCA landscape architects and Broadbent Studio were appointment following a competitive tender process, organised by the Environment Directorate of Denbighshire County Council. The challenge that followed, was how we would go about reinventing a tired and overly expansive promenade, that had lost it's reason for being. The name we proposed was Drift Parc. Our preliminary ideas and objectives were exhibited extensively in the town in 2002 before the proposals were developed further to provide the necessary planning approval. The Promenade was divided into five, 58m wide, sheltered gardens, by a series of low walls that follow the lines of the existing beach groynes on to the shore. The walls provide the first degree of shelter, and give each garden a distinct theme and user target. The north and south end of each garden is enclosed by lower walls, approximately 500mm high, to provide informal sitting, control the ingress of sand from the beach, and provide shelter for the ornamental planting. Consultation continued in the detail design stage as the Local History Group helped to select the images and memories to be portrayed in the 'Moments in Time' artwork. This community art and photography project made a positive link between young people today and the wonderful photography taken by their relatives enjoying Rhyl beach over past generations. The images were screen printed onto 400mmx250mm ceramic tiles and then set into rebated portions of the concrete ‘community wall’, as part of the theatre garden. The ‘Finding Time’ Rhyl Discovery Trail was designed in collaboration with Rhyl Museum. Artworks are scattered and inlayed throughout the scheme like flotsam on the beach, each celebrating specific Rhyl events and colourful characters. Designs in ceramic, bronze, stone, concrete, and carved timber were included. Children from Ysgol Mair Primary School were involved in the design and production of the cast bronze ‘Fish Faces’ feature in the Water Play Garden. 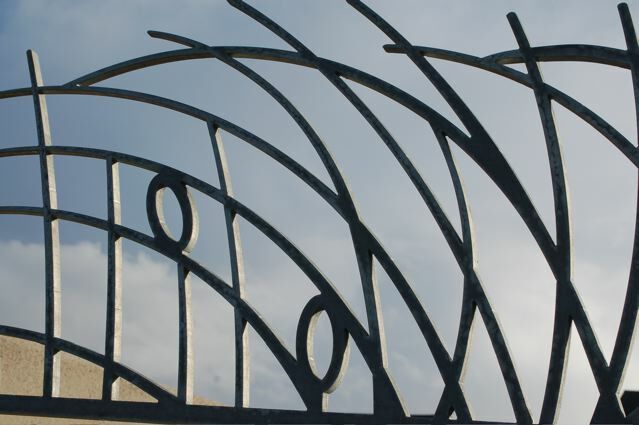 Inclusion of bespoke artwork was an integral part of the design from the outset in order to tell a story of Rhyl’s development as a resort and further enhance “ownership”. The scheme also incorporated bespoke illuminated timber groynes, bespoke signs, distinctive seating, boulders, and also monumental timber and slate beacons which lean defiantly into the wind and follow the geometry of the separate gardens, helping to establish a visual rhythm along the length of the maritime park. This award-winning seafront park was opened in 2008 with its new paddling pool, play area and mini golf which have been popular with both local people and visitors to Rhyl. The amphitheatre and surrounding gardens provide a place to picnic and sunbathe with views across the beach and out to sea.